I’ve heard a lot of raves about Eastern Standard but honestly? I/we don’t really hang out in that part of Boston all that often so going there would mean going out of our way to get there. Luckily, my friend Kathleen and I had a seminar to attend at BU one night and since we had time to get a bite to eat beforehand, I convinced her to try it out with me. It was the day where the temperature was abnormally warm and I think it reached about 75 degrees at one point, so didn’t mind walking from 808 Commonwealth Avenue where we parked the car down the street to 528. (Although, don’t wear your boots for the first time of the season and do that because it wasn’t a short walk and you’ll feel it afterward.) It was barely 5 pm so there was plenty of space in their outdoor patio area. 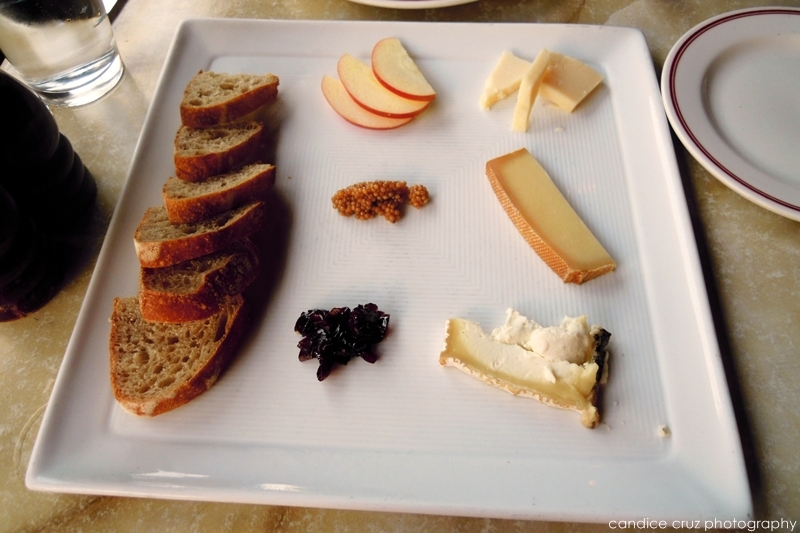 We shared the three artisanal cheeses plate which was a great appetizer choice. I can’t remember the three cheeses that they gave us, but they three accompaniments from top to bottom in the photo were apple slices, marinated mustard seeds (they look like caviar, no? ), and candied shallots. We both really liked the top and bottom cheeses (the bottom one looked like a brie but it was a goat cheese from Spain … ah yes, now somehow I remember). The middle cheese was quite strong but somehow we still managed to eat it (goes to show you how much we both love cheese). One thing that I learned about Kathleen during this outing was that she likes runny eggs the way I do (if not more than I do! 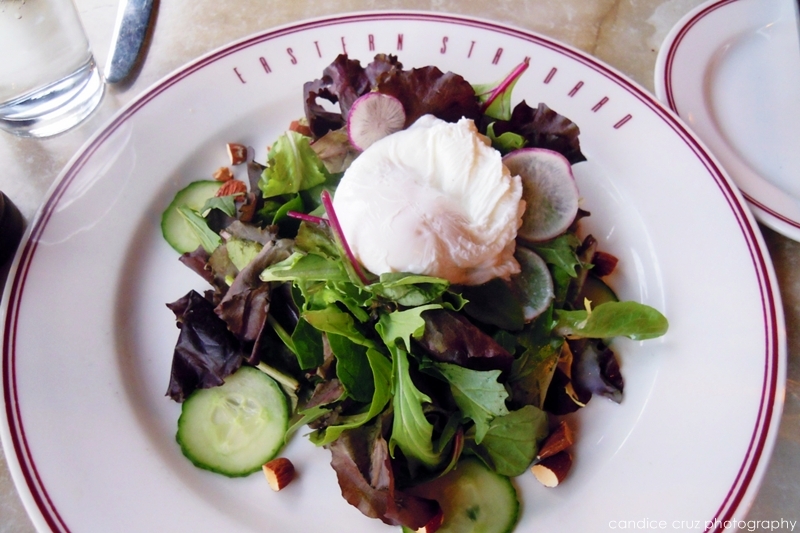 ), and she asked for one on top of her mixed greens salad which seemed like an ingenious thing to do. She said it was a great salad. 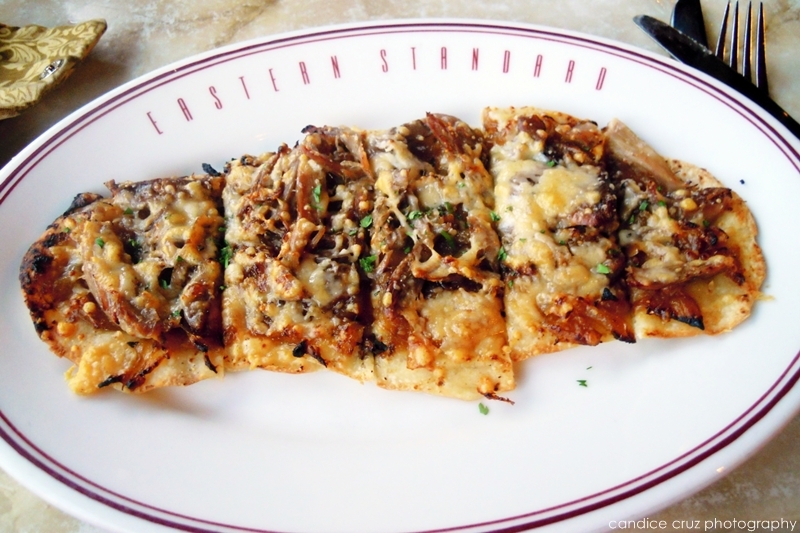 I had the duck confit grilled flatbread which was served with caramelized onions and asiago cheese. It normally comes with pears too but I’m not sure I can eat them so I asked them to omit them. It was quite delicious, but then again, when have I not liked anything with duck confit involved? It was a tiny bit salty (the asiago maybe?) so I’m sure the pear would’ve been a nice counter flavor. Unfortunately, by the time we finished the cheese appetizer we were running out of time and our entrees had not arrived yet. We explained to the waitress that we were in a hurry to catch a show so luckily she gave us the check right when our food arrived. We literally had to inhale our food down which kind of sucked because we couldn’t really enjoy each bite, and I ended up doggy-bagging half my flatbread to take home. The waitress and hostess were understanding and helped us get out of there rather quickly. I’d like to go back there sometime soon though. It seems like a really cool place to hang out at, and it’s much larger than it seems from the outside. I think it’s a place my husband so I’ll have to take him there sometime. This entry was posted in Boston, dinner, duck, eastern standard, food by shortcakescraps. Bookmark the permalink.